The Dusseldorf Grand Prix 2017, the first IJF Grand Prix of the year, opened on Friday with Rio 2016 Olympic medallists and world champions in action at the Mitsubishi Electric Halle. The IJF World Judo Tour 2017 opened in France with the Paris Grand Slam earlier this month and has now settled in Germany for one of the most established events on the circuit. Germany’s annual Grand Prix has called Dusseldorf home since 2010 and has attracted the top judoka and nations from all continents. This year the three-day event is the most important Grand Prix in the history of the IJF World Judo Tour as the reward for winning gold is a record-breaking 700 points towards the IJF World Ranking List. Three women’s categories and two men’s categories were settled on day one as the women’s -48kg, -52kg and -57kg judoka and the men’s -60kg and -66kg athletes aimed to scoop the new points windfall and catapult themselves up the rankings. The IJF’s new rules, which were adopted for the first time on the IJF World Judo Tour 2017 at the Paris Grand Slam, are being used throughout the year until this year’s World Championships in August. Before the medal contests and final block, the IJF and German Judo Federation were represented on the stage for the opening speeches. Mr. Vladimir BARTA, IJF Head Sport Director, said: “Good afternoon Mr. President, ladies and gentlemen, it is a pleasure to be here in Dusseldorf for the first Grand Prix of the 2017 season. “This year we have 346 judoka competing from 50 nations and the reward for a gold medal is now 700 points which is a record for a Grand Prix event. IJF Hall of Famer, Mr. Neil ADAMS, was one of the most influential figures in the shaping and application of the changes, and is present in Germany in his new role as an IJF Referee Supervisor. 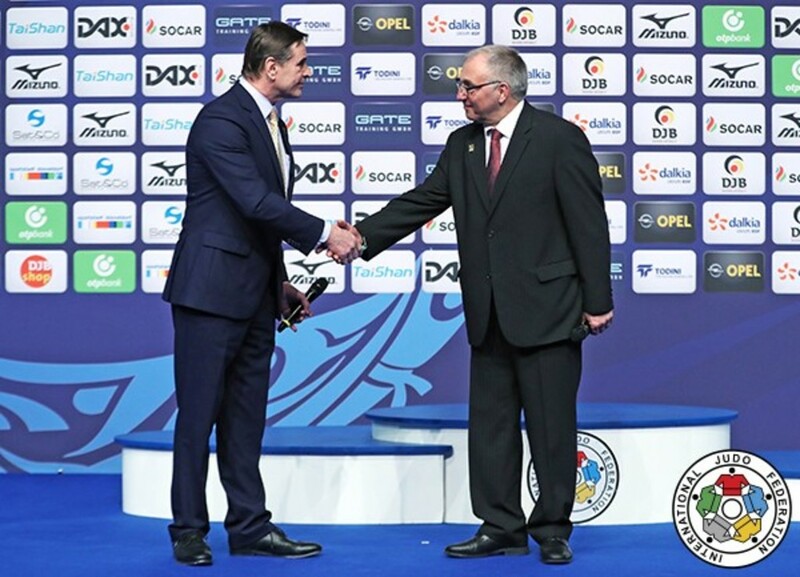 ADAMS, who is working alongside fellow Referee Supervisors Mr. Florin Daniel LASCAU and Alexander JATSKEVITCH and the IJF Refereeing Commission, explained his new role and its challenges. “It is not a contest between us and the referee’s or the commission, we are here to help with the implementation of the rules and to make sure they are implemented in the right way. We look for mistakes and hope to make the job easier for referees. The double Olympic silver medallist said that the changes are universal in that everyone has to adjust to them and Adams himself is getting to grips with his new position. “My new role presents new challenges and different responsibilities,” said Adams. Day two of the Dusseldorf Grand Prix will see four weight categories in action as the men’s -73kg and -81kg categories will compete alongside the women’s -63kg and -70kg categories with four more winners set be crowned in Germany. Tokyo Grand Slam bronze medallist TONAKI Funa (JPN) moved one step closer to World Championships selection after winning the third Grand Prix gold medal of her career. The 21-year-old was unbeatable in Dusseldorf as she won all four contests by ippon including the final against Glasgow European Open bronze medallist Melanie CLEMENT (FRA). TONAKI, who like many of her lighter Japanese colleagues is masterful on the ground, was able to wrap up her opponent with a mune-gatame for 20 seconds and ippon in the opening minute. In the first semi-final CLEMENT bested European bronze medallist Monica UNGUREANU (ROU) by a waza-ari to guarantee a career-best result. In the second semi-final TONAKI proved too much for Zagreb Grand Prix silver medallist Noa MINSKER (ISR) to contend with as the latter received hansoku-make for three shidos with no scores registered. The first bronze medal contest was won by MINSKER who frustrated top seed and u23 European champion Milica NIKOLIC (SRB). The Israeli was penalised for not taking a grip but finished with a flurry of attacks before countering her in-form opponent for a ura-nage which earned a waza-ari score with 35 seconds left on the clock. 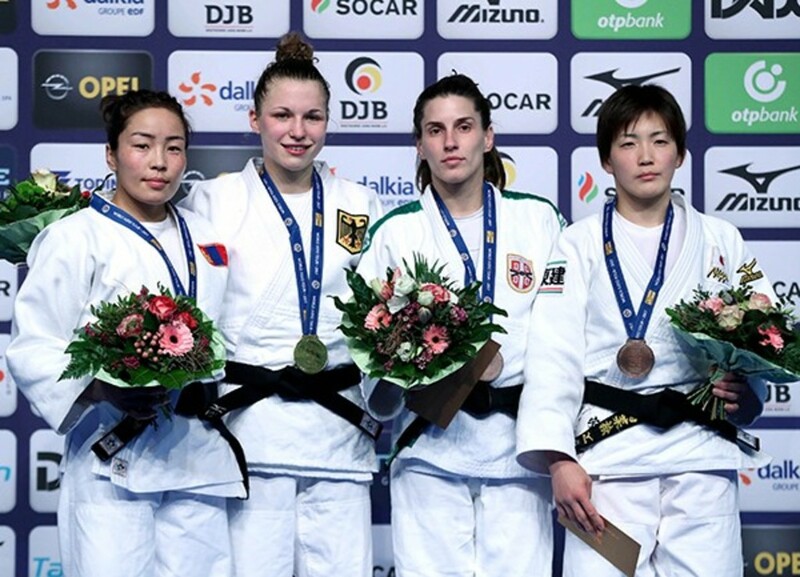 There was not enough time left for the Serbian to mount a comeback as the aggressor MINSKER deserved to win the second Grand Prix medal of her career. The second bronze medal was won by UNGUREANU who dismissed Casablanca African Open bronze medallist Melodie VAUGARNY (FRA). The French judoka was in a Grand Prix medal contest for the first time and was confidently dispatched by her Romanian opponent who, having been penalised with a shido for a leg grab, shaped up for a tani-otoshi attack but also lifted her rival for ippon after just a minute of action. Tokyo Grand Slam silver medallist ABE Uta (JPN) wrote her name into the record books as she became the youngest ever winner at an IJF World Judo Tour event. 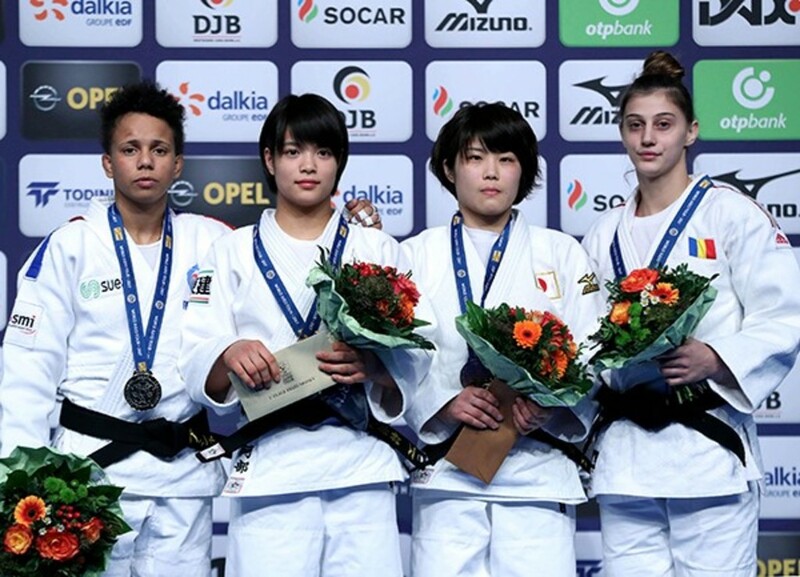 ABE, 16, the younger sister of 19-year-old Paris Grand Slam winner ABE Hifumi, saw off former European silver medallist Amandine BUCHARD (FRA) with a low uchi-mata for a waza-ari. World number 46 ABE, who turns 17 in July, utilised her favourite technique for a waza-ari which was the difference after four minutes. World number 73 BUCHARD will be delighted to be back on the podium after a testing run which saw her move back and forth between the -48kg and -52kg categories. ABE has a high school competition in March and the All Japan Championships in April and will certainly be a major player on the IJF World Judo Tour for the remainder of 2017. In the first semi-final ABE defeated Alexandra-Larisa FLORIAN (ROU) by the maximum score with a uchi-mata. 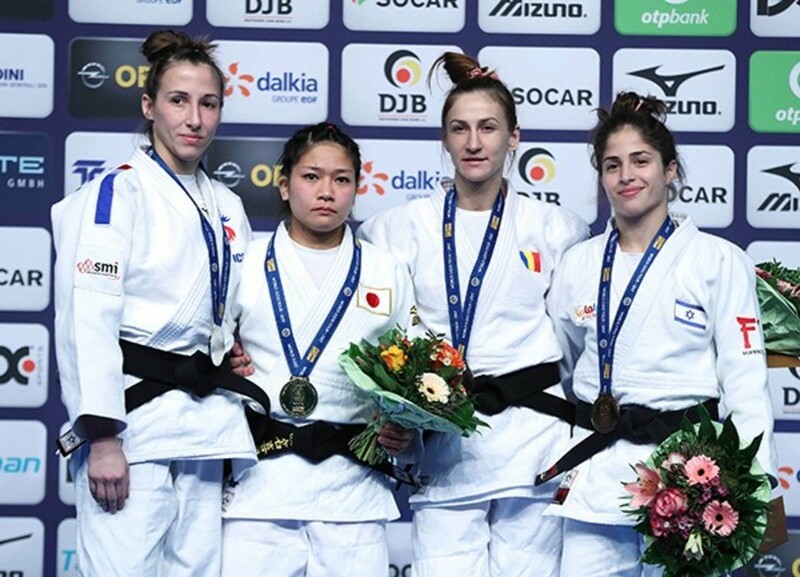 In the second semi-final former Baku Grand Slam winner Gili COHEN (ISR) was held down by BUCHARD with a tate-shiho-gatame for 20 seconds and ippon. The first bronze medal was clinched by Tokyo Grand Slam bronze medallist SHISHIME Ai (JPN) who responded to her semi-final blip with a routine win over COHEN. 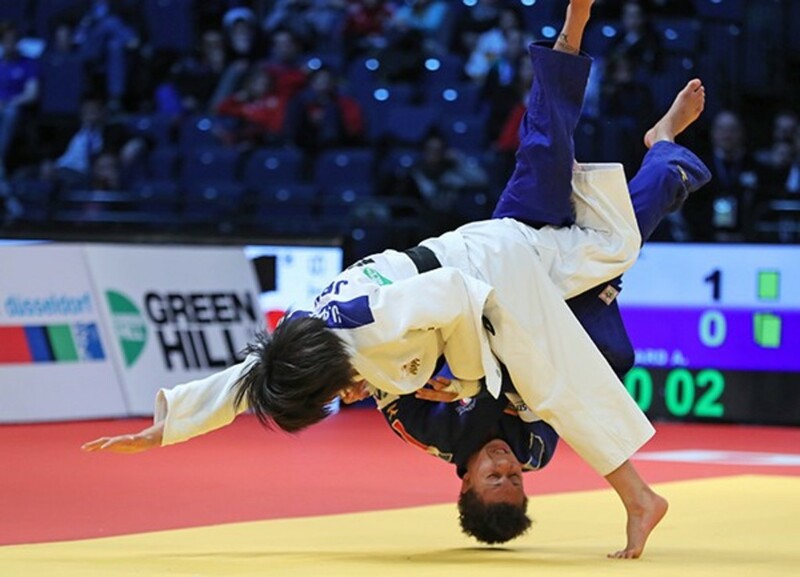 Number one seed SHISHIME, who won in Germany last year, was unable to successfully defend her title but did enough for a bronze medal as she had total upper body control over her opponent who was trapped in a mune-gatame for 20 seconds. The second bronze medal was won by FLORIAN who floored former Rio Grand Slam winner Eleudis VALENTIM (BRA) with a stunning piece of ashi-waza. The young Romanian caught her opponent with a de-ashi-barai for a wonderful finish after 75 seconds. Abu Dhabi Grand Slam silver medallist Theresa STOLL (GER) stunned Rio 2016 Olympic silver medallist DORJSUREN Sumiya (MGL) for a sensational home victory in the -57kg final. World number 27 STOLL, 21, an ippon seoi-nage specialist, was a surprise finalist but the greatest shock was still to come as the game German not only took DORJSUREN into golden score but countered the Ulaanbaatar judoka after one minute for a match-winning waza-ari. Five-time Grand Prix winner DORJSUREN, 25, whose life story has been told in a special film in Mongolia, has extended her lead at the helm of the -57kg rankings but 700 points for STOLL and a maiden Grand Prix crown is a dream start to 2017. In the first semi-final DORJSUREN bested former world champion UDAKA Nae (JPN) who received a third shido for passivity and therefore hansoku-make. Both judoka had two shidos and no scores to their names until the Japanese committed one mistake too many to be relegated into the repechage while DORJSUREN advanced into the final. In the second semi-final home judoka STOLL defeated Tyumen Grand Slam bronze medallist Jovana ROGIC (SRB) after a minute of golden score with a ko-soto-gake yielding ippon. Neither judoka had the edge in regulation time but the German STOLL took the initiative in added time to seal a place in the gold medal contest. The first bronze medal was won by ROGIC who thwarted Qingdao Grand Prix winner Anastasiia KONKINA (RUS) with a waza-ari score which was the only score in the four minute contest as Serbia got off the mark on day one in Germany. The second bronze medal was won by UDAKA in just 40 seconds as she blasted her way onto the podium against Tyumen Grand Slam silver medallist Daria MEZHETCKAIA (RUS). UDAKA drove past her opponent with her trademark osoto-gari for ippon as Russia were left disappointed in both -57kg bronze medal contests. 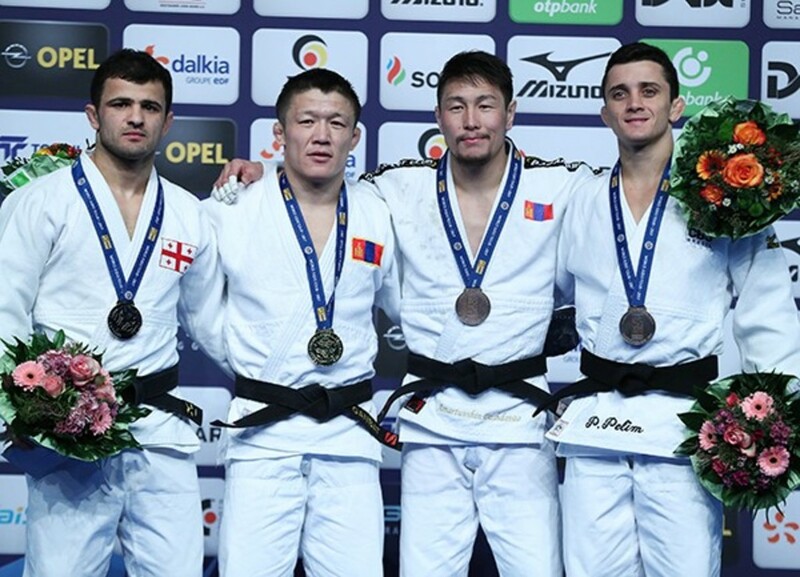 Former world champion GANBAT Boldbaatar (MGL) returned to the top of the medal podium on the IJF stage with a determined display in Germany. The Mongolian, who last claimed gold at the Baku Grand Slam last year, rolled over Paris Grand Slam bronze medallist Amiran PAPINASHVILI (GEO) for a waza-ari score and only his second IJF gold medal since winning the World Championships in 2014. In the first semi-final Glasgow European Open winner Phelipe PELIM (BRA) lost out to GANBAT by a waza-ari in golden score. In the second semi-final former world silver medallist DASHDAVAA Amartuvshin (MGL) was well beaten by PAPINASHVILI by ippon after the Georgian initially led by a waza-ari. The first bronze medal was won by DASHDAVAA who rallied in golden score to defeatformer European bronze medallist Ashley MCKENZIE (GBR). The Mongolian was off the pace in regulation time as MCKENZIE had the better of the first four minutes. With no scores registered a winner could only be determined with additional time and DASHDAVAA caught his opponent with a sumi-gaeshi for a match-winning waza-ari score and his 13th Grand Prix medal. The second bronze medal was won by PELIM who defeated Abu Dhabi Grand Slam winner Francisco GARRIGOS (ESP) after two minutes of golden score with a quickfire te-waza movement. European champion Vazha MARGVELASHVILI (GEO) followed up on his Paris Grand Slam bronze medal with Grand Prix gold in Germany. The gritty Georgian conquered 21-year-old Kodokan Cup winner ISODA Norihito (JPN) in the final. ISODA was a Cadet World Championships silver medallist in 2011 in a Japanese team which also included the likes of Tokyo Grand Slam winners NAGAYAMA Ryuju (JPN and ASAHINA Sarah (JPN). ISODA worked his way through to the final without raising any eyebrows but his coach always had complete faith in his judoka as former world silver medallist KANAMARU Yusuke was already in his suit – a requirement only for the final block – from the opening contest on Friday morning. World number 10 MARGVELASHVILI sealed gold after nine seconds of golden score with a waza-ari from an uchi-mata as he hunts down top spot on the World Ranking List. 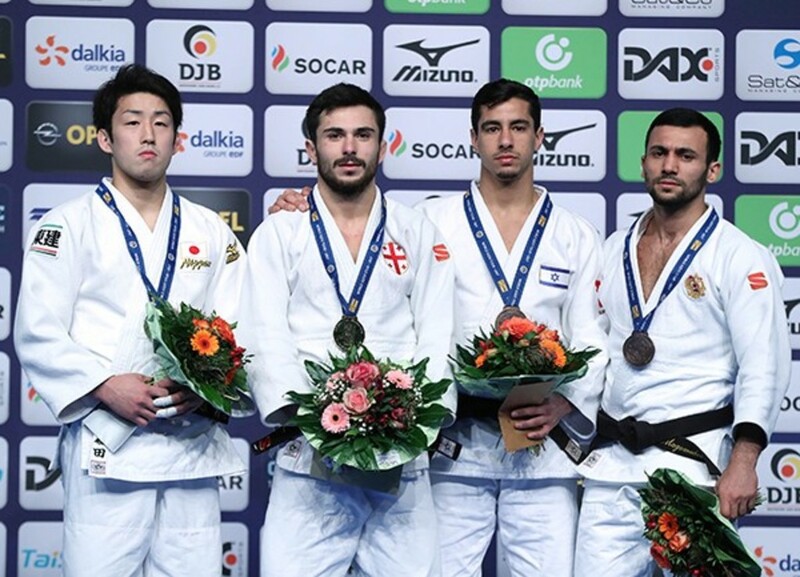 In the first semi-final ISODA pinned down Zagreb Grand Prix silver medallist Baruch SHMAILOV (ISR) for 20 seconds and ippon via a mune-gatame hold. In the second semi-final three-time Grand Prix bronze medallist Tal FLICKER (ISR) was overwhelmed by MARGVELASHVILI who scored three waza-ari without reply. The Georgian opened with a waza-ari from a hip throw and, as there is no longer waza-ari-awasette-ippon, added a second and third with his uchi-mata for a place in the -66kg final. The first bronze medal was won by FLICKER who beat former Budapest Grand Prix bronze medallist Sergiu OLEINIC (POR) by two scores. FLICKER found his scoring touch in the final block as he threw on two occasions for waza-ari scores while OLEINIC could not trouble the scoreboard. The second bronze medal went to former world bronze medallist Kamal KHAN-MAGOMEDOV (RUS) who launched SHMAILOV with an emphatic o-goshi for the maximum score and bronze at the first Grand Prix of 2017.